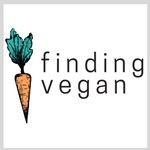 How to Make Oil-free Vegan Mushroom "Bacon"
Crispy, savory, vegan mushroom bacon. Made on the stove top with a simple, oil-free marinade of tamari, maple syrup, and balsamic vinegar. Okay, so I guess everyone can stop eating bacon from pigs now... right? I mean seriously, look at those mushrooms, it doesn't get any meatier than that. The marinade is just the right amount of smoky and salty with a hint of maple syrup to caramelize the mushrooms. 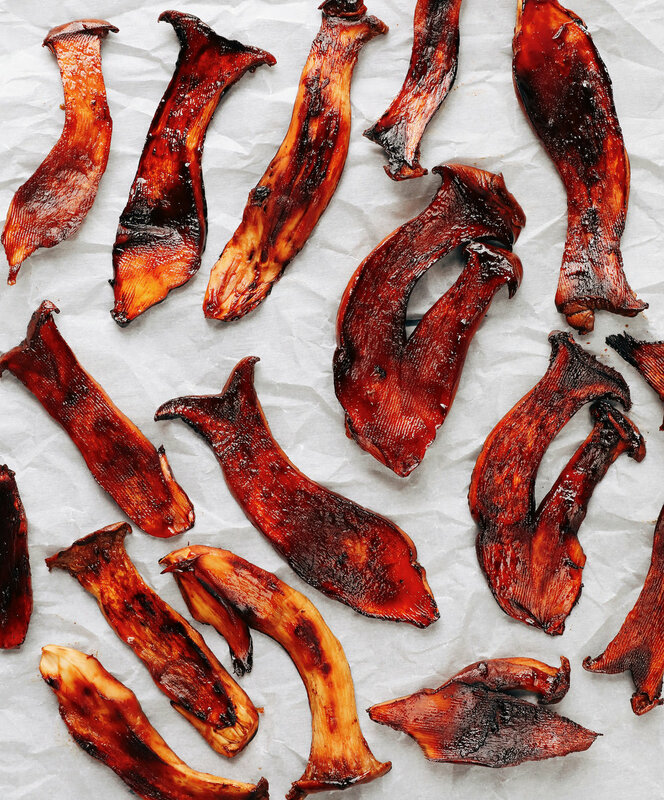 The chewy texture of these large king oyster mushrooms makes them an even more realistic vegan bacon-replacement. The best "bacon" mushrooms are going to be the larger ones like king oyster mushrooms, also called king trumpet mushrooms (shown below), as well as portobello mushrooms. 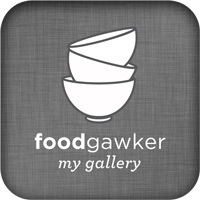 Both kinds will work well for this recipe, but I prefer king oyster mushrooms when I can find them. King oyster mushrooms are best sliced on a mandoline using a serrated slicing blade. This will give them the perfect looking texture for this recipe as well as ensure that the mushrooms are an even thickness which will help them to cook evenly. Aim for anywhere from 1/16th--1/8th of an inch in thickness. The mandoline I use and love is the Oxo Good Grips Mandoline (affiliate link), just make sure to always use the food holder or a cut proof glove when working with the mandoline. For portobello mushrooms, while you could slice them on a mandolin, I prefer to thinly slice them using a knife. Make sure your knife is freshly sharpened- it's especially important when slicing softer produce. Remove the portobello mushroom stem, then place your mushroom gills side up and carefully slice into long slices which are roughly 1/16th-1/8th in thickness, as evenly as possible. First, mix together all of the marinade ingredients (2 tbsp tamari, 1 tbsp balsamic vinegar, 1 tbsp maple syrup, and 1/2 tsp liquid smoke) in a small bowl. Place your sliced mushrooms (8 oz.) in a large bowl, then pour over the marinade. Toss a few times to fully coat each mushroom, then let them sit in the marinade for 10-15 minutes. Heat a nonstick skillet over medium heat, then once warm add a portion of the marinated mushrooms to the dry pan, placing as many as you can flat in the pan without layering or crowding them. You may need to do this in batches. Leave the marinade in the bowl for later use in the recipe. Let the mushrooms cook, undisturbed, for about a minute or until the bottom of the mushrooms turns golden brown. You may need to turn the heat down to medium/low or low if your pan starts smoking, but keep the pan pretty warm. Using tongs, flip the mushrooms back and forth every minute or two until each side is lightly charred and crispy. This could take anywhere from 5-8 minutes. Remove mushrooms from pan and set aside. Add your next batch of mushrooms to the pan in a single layer and again let them sit for the first minute until the bottoms turn golden, then flip them every couple of minutes until each side is light brown and slightly charred. This will take less time than the previous batch because the pan will be hotter, about 3-5 minutes. Once all batches have finished cooking, add the mushrooms you cooked in the previous batch(es) back to the pan and pour over the marinade. Turn the heat to low and cook for another 3 minutes or until the marinade has boiled away and the mushrooms are crispy on the edges but still have a nice sheen, then remove from pan and serve over rice or in any recipe where a bacon alternative is called for such as- sandwiches, wraps, or pasta. If you can't find king oyster mushrooms at your grocery store, try your local Asian market. I think the king oysters look a little more meaty, but whichever mushrooms you choose, both make for a fantastic, healthy, plant-based version of bacon. Portobello mushrooms are much easier to find and will also work well. 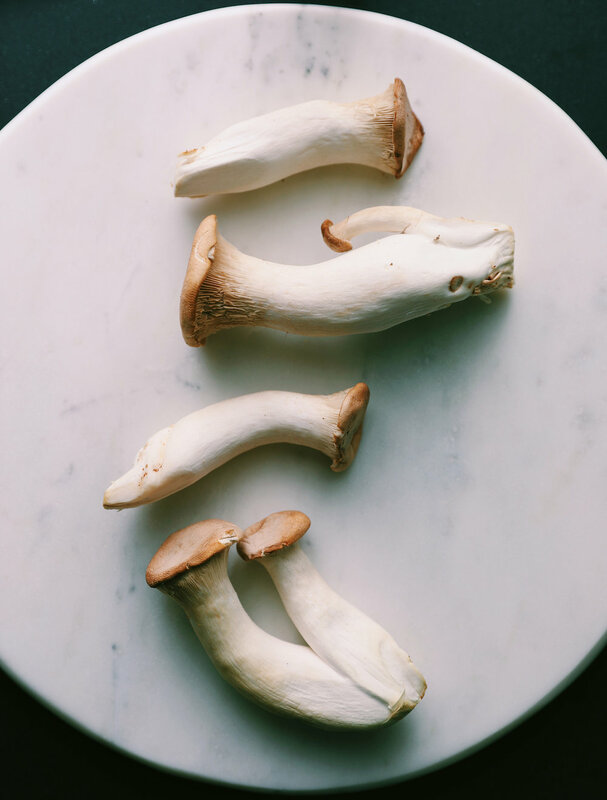 You may actually find that they cook slightly faster than the time listed for the king oyster mushrooms, depending on how thinly you slice them. 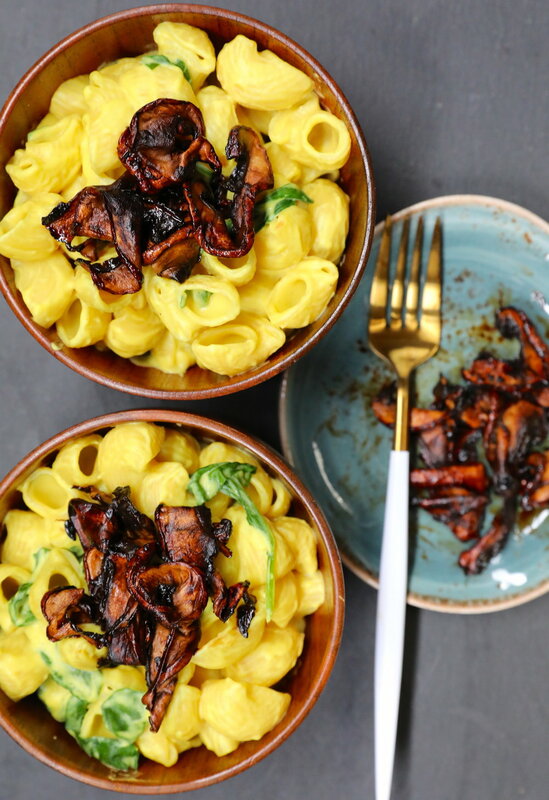 My favorite way to enjoy mushroom bacon is on top of some vegan mac and cheese. 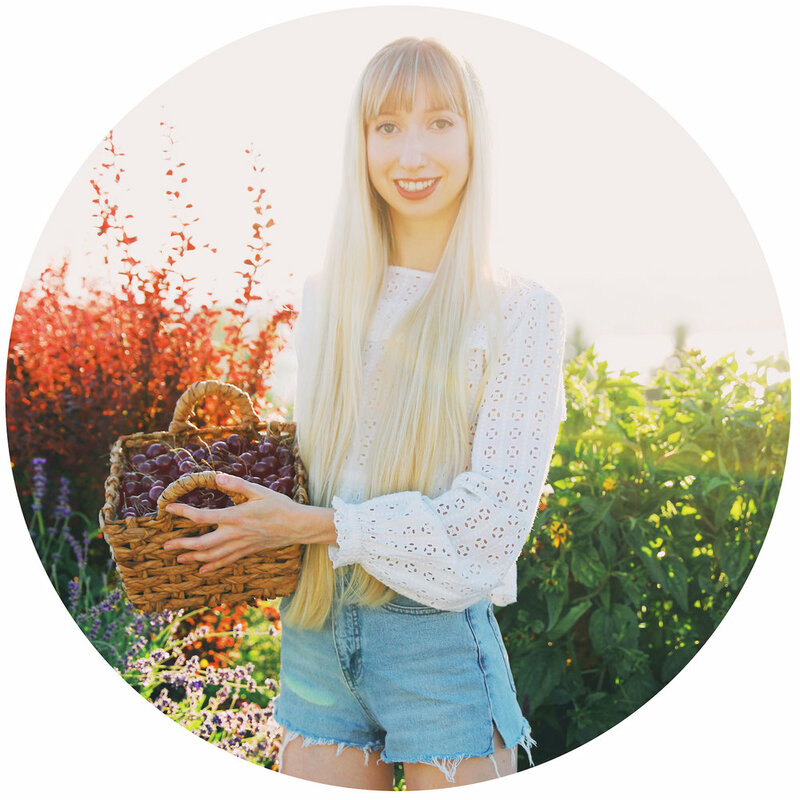 It's the ultimate comfort food, made extra healthy with mostly unprocessed, 100% plant-based ingredients. 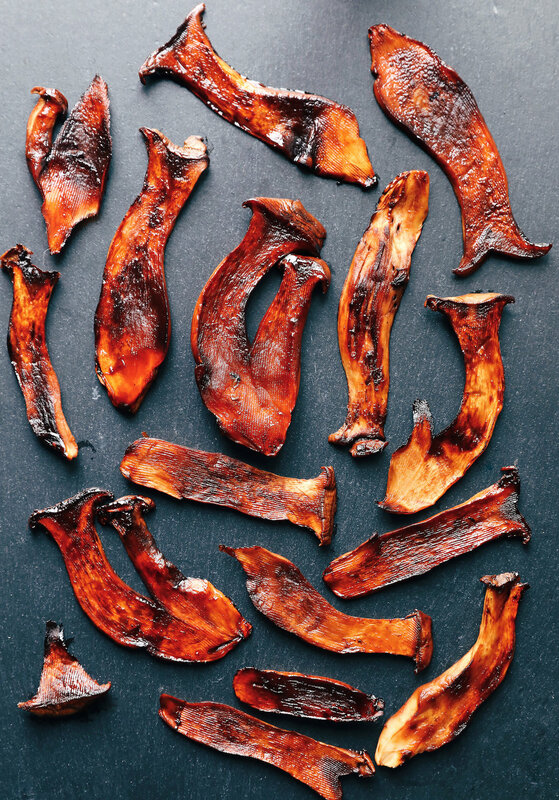 If you try this mushroom bacon recipe, let me know how it goes and what you serve it with!